Ginger root has captured the attention of the medical research world, thanks to its great promise as a functional food and natural medicine. We’ve written in the past about how ginger fights cancer on par with chemotherapy, without any side effects. This remarkable effect is due to ginger’s selective cytotoxicity: it targets cancer cells while leaving healthy cells unscathed. The study we documented in that article even found that ginger targets cancer stem cells (the “mother cells” that control the proliferation of cancer cell colonies) 10,000 times more effective than leading chemotherapy drugs. And this property, remarkable as it is, still only scratches the surface of ginger’s healing potential. It can work wonders for poor circulation, aches and pains, respiratory dysfunction or infection, prevention of infectious disease, and much more. These healing feats are well known to traditional healing systems, which have used ginger as an herbal tonic and medicine for thousands of years. Conventional Western medicine is a bit late to the scene but has finally begun to acknowledge the virtues of this incredible root, particularly because of the cancer research cited above. A new study has now added a new condition to the list of those against which ginger is highly effective: migraine headaches. It’s estimated that 28 million Americans suffer from migraines, which can cause pain so sharp and intense that it makes daily activities nearly impossible. Worst of all, there are few effective conventional treatment options, and nearly all of them carry side effects. The first line of defense is over-the-counter painkillers such as ibuprofen and acetaminophen. Despite being readily available and almost entirely unregulated, these drugstore staples come with serious risks, especially when used frequently. A growing body of evidence suggests that non-steroidal anti-inflammatory drugs (NSAIDs) are strongly linked with a long list of health issues, including ulcers, gastrointestinal damage, anemia, DNA damage, miscarriage, hearing loss, hypertension, and even sudden cardiac arrest. And most of the time, these drugs don’t even provide much relief from migraines, though countless individuals still reach for them in a desperate attempt to make the pain subside. This situation is far too common in pharmaceutical medicine: voluminous side effects, minimal efficacy. Pharmaceutical companies have developed prescription medications that are a major step up from OTC medications in terms of efficacy, however. The most commonly used migraine drugs are triptans (sumatriptan is usually the medication of choice), which constrict blood vessels and block pain receptors in the brain. 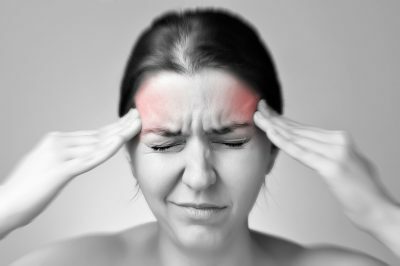 While sumatriptan and similar drugs provide quick relief for many migraine patients, the headaches often recur within twenty-four hours (sometimes worse than before taking the drug), and side effects like nausea, weakness, dizziness, and fatigue are common (which for some can be almost as disruptive as a migraine itself). Now here’s the exciting part: the study mentioned above, published in Phytotherapy Research, has demonstrated that ginger is just as effective as sumatriptan for alleviating migraines, without any of these side effects. During this double-blind, placebo-controlled study, researchers directly compared the effects of ginger against sumatriptan when given to patients who had suffered from regular migraines for an average of seven years. One group was given 250 milligrams of ginger powder, while the other was given 50 milligrams of sumatriptan in indistinguishable capsules. The results were extremely positive: the ginger powder was every bit as effective at alleviating migraine headaches (i.e. 90% efficacy within two hours of administration). Past research suggests that this therapeutic action can be traced back to the beneficial terpenes and phenolic compounds found in ginger, especially gingerol, shogaol (the main type of compound responsible for ginger’s anti-cancer activity), zingerone, paradol, galanals, and vallinoids. While the precise mechanisms of these compounds are unclear, research has found them to be profoundly effective in the treatment and prevention of other diseases—researchers hypothesize that antioxidant and anti-inflammatory activity play a large role. Previous studies with ginger have always used at least 1 gram (1000 milligrams) of ginger powder, or an extract with equal or greater levels of beneficial compounds. While 250 milligrams was sufficient for alleviating migraines in the study above, it stands to reason that higher doses could be even more effective. As always, though, talk to your doctor before taking high doses of any functional food as an acute treatment for medical conditions. It’s easy to experience the benefits of ginger, whether you’re battling migraines or simply want to optimize your health. Throw a bit of raw ginger root in your smoothies, or use ginger powder as a cooking spice. If you’d like to see what a concentrated dose of ginger can do for you, try out this excellent product, which contains a potent, liposomal ginger oil combined with turmeric and other anti-inflammatory ingredients.